A queue is a list of tickets that are categorized and displayed based on a set of conditions. HappyFox provides 4 pre-configured queues - Pending Tickets, All Tickets, Unresponded Tickets and Assigned to Me. 1. 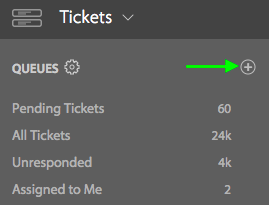 All tickets - Shows all the tickets that have come into the helpdesk. 2. Pending tickets - All the tickets that are on pending behavior status. 3. Unresponded - All tickets which do not have the first staff response sent to the customer. 4. Assigned to Me - All tickets which are assigned to you. You can create additional custom queues to further optimize the view for the agents. The feature is available for Fantastic and above plans. 1. 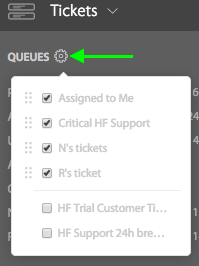 Click on the + icon beside the Queues header. 2. 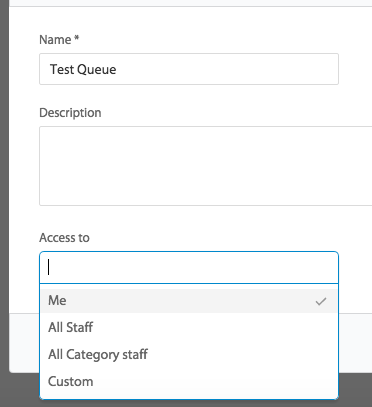 Add filter conditions in Create Queue page. Conditions can be added by clicking the “+” button beside the Match all or Match any option. Clicking on “+” will display set of predefined attributes with which you can define your condition. Multiple values for one attribute can be selected from the drop down as we add values. 3. Click on Preview to view the tickets that satisfy the given conditions. 4. Click Next to name your queue and choose your sharing options. 5. Access To options allows you to share your queues to different groups. 6. Click on Save to save the queue created. You can view this queue in your left navigation pane. Queues created or shared by others can be viewed or hidden by using the setting icon beside the QUEUES title. Check queues which should be displayed in the list and uncheck queues that should not to be displayed. All the entries in the list can be re arranged by clicking on the queue title and dragging it up or downwards. To edit any private/shared queues, click on the edit icon beside the queue title. This opens a window, where you can add or remove filter conditions, save or delete the modified queue.